Fox News analyst Frank Luntz, left, looks on as Ohio Secretary of State Jon Husted tells a policeman that he’ll stand up for them during an evening with the candidates for governor on Sunday at Genoa Church. 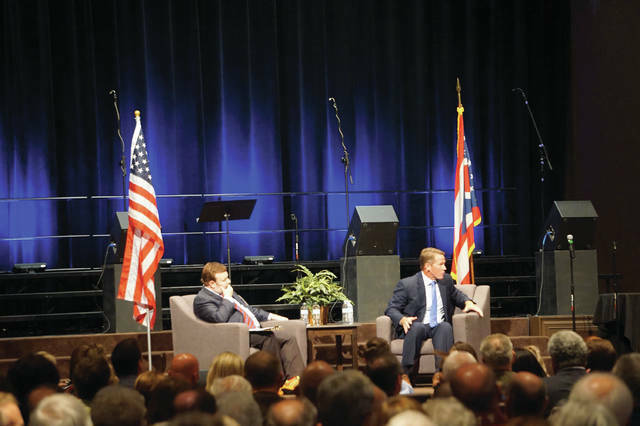 Four Republicans in the running to become Ohio’s next governor each explained why they were the best person for the job at a forum moderated by Fox News’ Frank Lutz Sunday night at Genoa Church in Westerville. Attorney General Mike DeWine, Secretary of State Jon Husted, U.S. Rep. Jim Renacci, and Lt. Gov. Mary Taylor each spent 18 minutes speaking with Luntz in a formal setting with an estimated 600 people who braved the rain, many of whom were young people from Ohio University. “After meeting all four candidates, I can tell you that you are in the room with the next governor of Ohio,” Luntz said to applause. The evening, billed as “Together for Ohio,” was sponsored by Cincinnati-based Citizens for Community Values. CCV President Aaron Baer said the organization’s purpose was to “inject Christ-centered values into the statehouse.” Baer noted that none of the Democratic candidates for Governor accepted the invitation to appear at the event. “I am not Chris Matthews in so many ways,” Luntz said, mocking the MSNBC Hardball host who impatiently interrupts his guests. Only two men in the audience spoke out, complaining that Luntz went easier in questioning DeWine than the other candidates. They were told to quiet down. All of the candidates said they were fighters heavily influenced by their faith, who wouldn’t compromise their core values. Renacci, a former mayor of Wadsworth, said he originally wasn’t planning on attending because it was his 34th wedding anniversary, but his wife Tina gave him the OK.
“Ohioans are being taxed too much. Thirty-four years ago, Ohio was the land of opportunity,” Renacci said. He said he supported “right to work” legislation and opposed Medicaid expansion. Between candidates, pollster Luntz asked attendees questions during the four minutes of commercials. He learned that the audience felt there was a culture war, with Hollywood, academia, and the media as the brainwashing enemies. One man said political correctness was killing our freedoms. “Every job I’ve held I think I’ve made a difference. I’m a problem-solver,” said DeWine, whose career includes stints in the U.S. and Ohio senate. If elected, he would appoint someone to solve Ohio’s opiate crisis. “We need to have a sense of urgency — we’re losing 18 people a day,” DeWine said. Of the four candidates, he was the only one to bash Barack Obama and liberals, but he said his wife Fran would screen his campaign ads to make sure they were appropriate. Taylor billed herself as the most conservative of the four, being pro-life and pro-Second Amendment, which drew applause. When asked about banning the bump stock used in the recent Las Vegas massacre, Taylor said no. “The discussion we should be having is what was wrong with that individual to commit that heinous act,” Taylor said. Her two sons are in recovery from opiate addiction, she said, and called on churches to provide more of a support system to those with that disease. When asked about influences, Husted said he was reading a book about former U.S. President and Ohioan Ulysses Grant. Luntz said that’s the first time he’d heard Grant mentioned. “We think what we’re going through now is tough, but it doesn’t compare to Abraham Lincoln and the Civil War and Grant with Reconstruction,” Husted said. The conversations took place in Delaware County, where Ohio Gov. John Kasich lives. However, Kasich was not popular with this audience. Husted said he disagreed with Kasich’s decision not to attend the Republican National Convention in Cleveland. https://www.delgazette.com/wp-content/uploads/sites/40/2017/10/web1_Luntz-Husted.jpgFox News analyst Frank Luntz, left, looks on as Ohio Secretary of State Jon Husted tells a policeman that he’ll stand up for them during an evening with the candidates for governor on Sunday at Genoa Church.